WFTISA’s main objective is to assist young people in South Africa to continue attending school and further their education. We believe that for most of those young people education can “make poverty history???. In 1995 a sponsorship program was initiated, paying school fees and buying essential books for two young people at Thuto Lesedi High School, Vosloorus, and a township near Johannesburg. By 2005 the number of sponsored pupils was 15. In January 2007 the number was increased to 32. The school has 1,873 pupils, most of whom need help. WFTISA, where possible, follows the progress of pupils after Matric. This year WFTISA learned that Sibusiso Hlongwane, one of the first sponsored students, had transferred from university to a college to complete his electrical engineering course. In a telephone conversation, Sibusiso Informed Mmapula Small, (chair of WFTISA), that the move was due to financial constraints. In 2007 he had no money to pay the fees for the final six months. WFTISA offered to pay the £68 he needed. 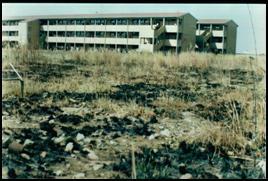 Thuto Lesedi Secondary School, Vosloorus. In January this year, we learned that Sebabatso Rantsane successfully completed Matriculation (A level equivalent) at the end of 2006. He was the only sponsored student at Matric level that year. In January 2007, he was reported to be working as a clerk in a local authority Office. During a visit to the school in 2005, discussions with sponsored pupils and teachers had revealed that some of the 15 sponsored pupils had no food. The Home economics teacher informed me that some pupils used to stand outside, begging for food from the cookery practical lessons. Having identified the need, teachers brought groceries from their homes to supplement the food. The school encouraged pupils who could afford lunch, to share their lunch boxes with those without food. We believe that effective education is attained through adequate nutrition. 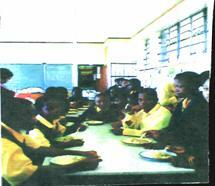 In May 2005 WFTISA sent £1000 to provide lunch for the sponsored pupils. Lunch at Thuto Lesedi Secondary School. In 2006 the school reported that the money sent had been used to include another 260 pupils. Those were the most destitute among other orphans and vulnerable young people at the school. In October WFTISA sent £500. Bonga is one of those young people. In his letter to WFTISA he wrote “sometimes I travel to school without eating anything. Not that I don’t want to eat, it’s because there is no food to eat and you can’t listen careful at school because you hungry??? During a visit to the school in January 2007, the Home Economics teacher leading the lunch program informed me that the additional £500 WFTSA sent in October 2006 had enabled them to provide food for an evening meal and food packs for week-ends and holidays. In January 2007 the school was given a total £2090 for the food Program. In order to reach more children, WFTISA is helping a project for women who are HIV positive or living in families with HIV/AIDS, “Azwikundi Women’s Health and Training??? a Venda word for “it is possible?? ?, by buying their Handicraft and selling them in the U.K.
South Africa is reported to have the most number of AIDS orphans in the world. By the end of 2005, according to UNAIDS estimates,there were five and a half million people living with HIV in South Africa, and almost 1,000 AIDS deaths occurring every day. The new National Strategic Plan for HIV and AIDS and Sexually transmitted diseases for 2007 – 2011 outlines primary goals. The stated intention is to achieve 50% reduction in the rate of new infections by 2011, and to provide an appropriate package of treatment, care and support services to at least 80% of people living with HIV and their families by 2011. As the HIV/AIDS epidemic rages, the number of young people needing assistance continues to rise. Where parents are dead, ill or unemployed, the family has no income. Some young people live in a family headed by a poor grand-parent. Others are in “child headed households??? Sebongile Khumalo is one example of the young people in such circumstances. Her mother died in 2000, father in 2001 and grand- mother in 2002. She now lives with an unemployed neighbour, whose husband died recently, leaving a wife and three children. 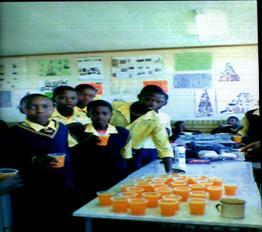 In 2007 WFTISA’s objective is to work with our supporters to reach all poor young people at Thuto Lesedi High school. The school has 1,873 pupils, a significant number of whom need help. H.E.A.R.T’s “Book and 10pence??? appeal continues. 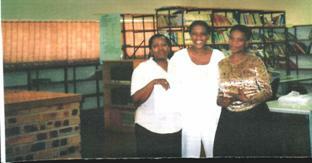 In 2006 WFTISA collected 2900 books for the project. We thank all those who contributed, and hope you and others will continue to do so. 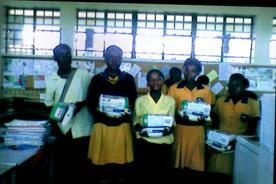 WFTISA needs all the help it can get in order to support the young people at Thuto Lesedi Secondary School. Our objective is to help those young people “make poverty history?? ?, and to quote ACTSA, “Reap the Fruits of Freedom???. You Can Help. Please be Generous: Education is their life line. Please be Generous. Education is their life line. 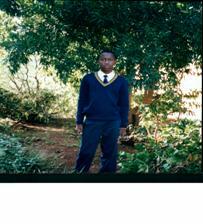 During my visit to South Africa in January 2007, I was contacted by three rural schools who had heard of the project. They were pleading for books. Although by the end of 2006, Community H.E.A.R.T had sent more than 2 million books to schools all over South Africa, the need is still great. Historically black schools were deprived of books during the apartheid era. It will take several years to meet the need for books.